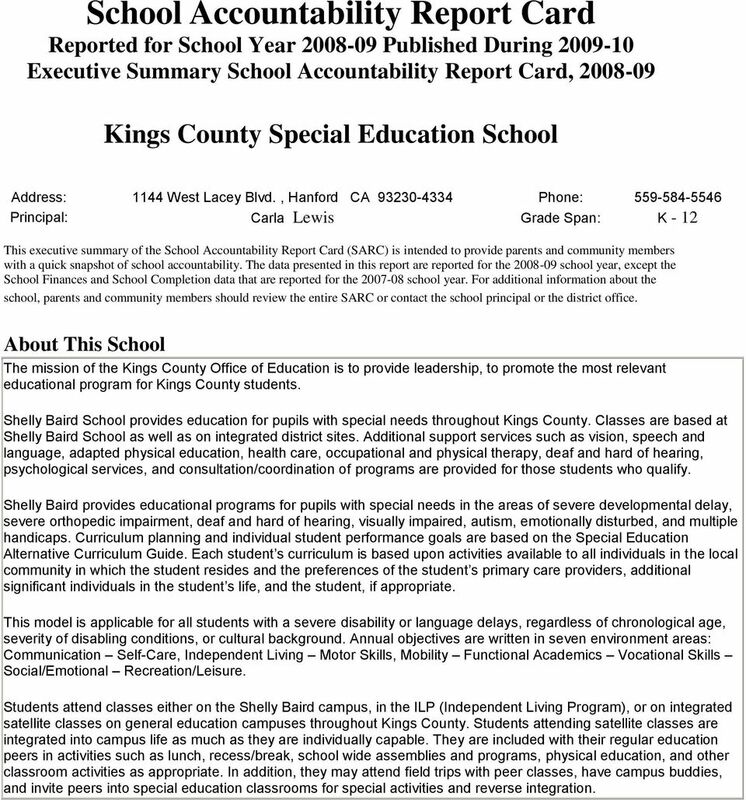 Download "Kings County Special Education School"
1 School Accountability Report Card Reported for School Year Published During Executive Summary School Accountability Report Card, Kings County Special Education School Address: 1144 West Lacey Blvd., Hanford CA Phone: Principal: Carla Lewis Grade Span: K - 12 This executive summary of the School Accountability Report Card (SARC) is intended to provide parents and community members with a quick snapshot of school accountability. The data presented in this report are reported for the school year, except the School Finances and School Completion data that are reported for the school year. For additional information about the school, parents and community members should review the entire SARC or contact the school principal or the district office. About This School The mission of the Kings County Office of Education is to provide leadership, to promote the most relevant educational program for Kings County students. Shelly Baird School provides education for pupils with special needs throughout Kings County. Classes are based at Shelly Baird School as well as on integrated district sites. Additional support services such as vision, speech and language, adapted physical education, health care, occupational and physical therapy, deaf and hard of hearing, psychological services, and consultation/coordination of programs are provided for those students who qualify. Shelly Baird provides educational programs for pupils with special needs in the areas of severe developmental delay, severe orthopedic impairment, deaf and hard of hearing, visually impaired, autism, emotionally disturbed, and multiple handicaps. Curriculum planning and individual student performance goals are based on the Special Education Alternative Curriculum Guide. Each student s curriculum is based upon activities available to all individuals in the local community in which the student resides and the preferences of the student s primary care providers, additional significant individuals in the student s life, and the student, if appropriate. This model is applicable for all students with a severe disability or language delays, regardless of chronological age, severity of disabling conditions, or cultural background. Annual objectives are written in seven environment areas: Communication Self-Care, Independent Living Motor Skills, Mobility Functional Academics Vocational Skills Social/Emotional Recreation/Leisure. Students attend classes either on the Shelly Baird campus, in the ILP (Independent Living Program), or on integrated satellite classes on general education campuses throughout Kings County. Students attending satellite classes are integrated into campus life as much as they are individually capable. They are included with their regular education peers in activities such as lunch, recess/break, school wide assemblies and programs, physical education, and other classroom activities as appropriate. In addition, they may attend field trips with peer classes, have campus buddies, and invite peers into special education classrooms for special activities and reverse integration. 7 Grade Ungraded Secondary 48 Total Enrollment 332 Student Enrollment by Group (School Year ) This table displays the percent of students enrolled at the school who are identified as being in a particular group. Group Percent of Total Enrollment African American 5.44 % American Indian or Alaska Native % Asian 1.26 % Filipino 1.67 % Hispanic or Latino % Pacific Islander 0.42 % White (not Hispanic) % Multiple or No Response 0.42 % Socioeconomically Disadvantaged % English Learners 9.00 % Students with Disabilities % Average Class Size and Class Size Distribution (Secondary) This table displays by subject area the average class size and the number of classrooms that fall into each size category (a range of total students per classroom) Subject Avg. Class Size Number of Classrooms Avg. Class Number of Classrooms Avg. Class Number of Classrooms Size Size English Mathematics Science Social Science III. 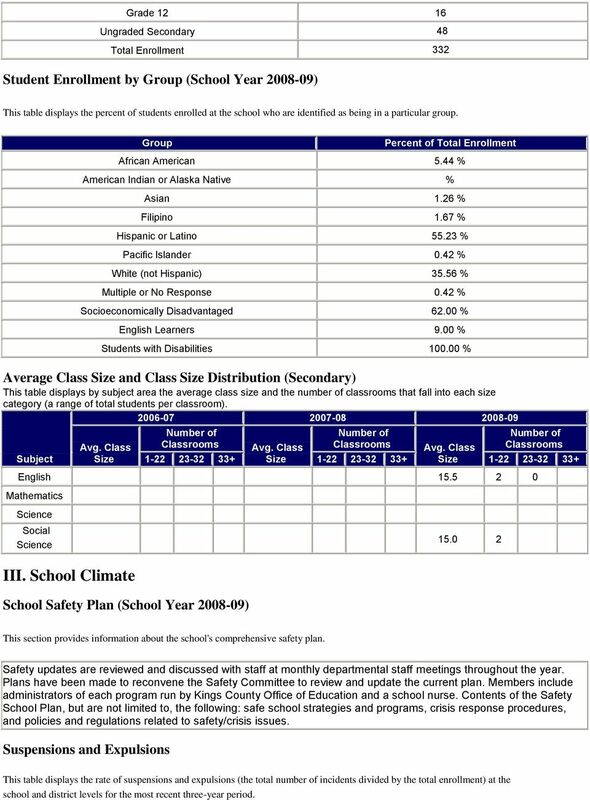 School Climate School Safety Plan (School Year ) This section provides information about the school's comprehensive safety plan. Safety updates are reviewed and discussed with staff at monthly departmental staff meetings throughout the year. Plans have been made to reconvene the Safety Committee to review and update the current plan. Members include administrators of each program run by Kings County Office of Education and a school nurse. 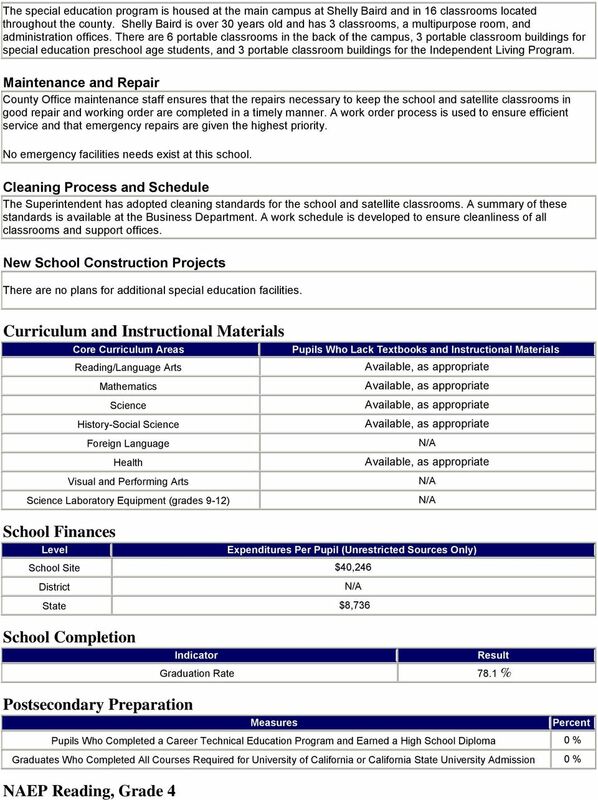 Contents of the Safety School Plan, but are not limited to, the following: safe school strategies and programs, crisis response procedures, and policies and regulations related to safety/crisis issues. Suspensions and Expulsions This table displays the rate of suspensions and expulsions (the total number of incidents divided by the total enrollment) at the school and district levels for the most recent three-year period. 12 This table displays the percent of students, by group, achieving at the Proficient or Advanced level (meeting or exceeding the state standards) for the most recent testing period. Percent of Students Scoring at Proficient or Advanced Group English-Language Arts Mathematics Science History-Social Science African American * * * American Indian or Alaska Native Asian Filipino * * Hispanic or Latino * Pacific Islander * * White (not Hispanic) * Male * Female * Economically Disadvantaged * English Learners 15 8 * * Students with Disabilities Students Receiving Migrant Education Services * * Note: Scores are not shown when the number of students tested is 10 or less because the number of students in this category is too small for statistical accuracy or privacy protection. In no case shall any group score be reported that would deliberately or inadvertently make public the score or performance of any individual student. 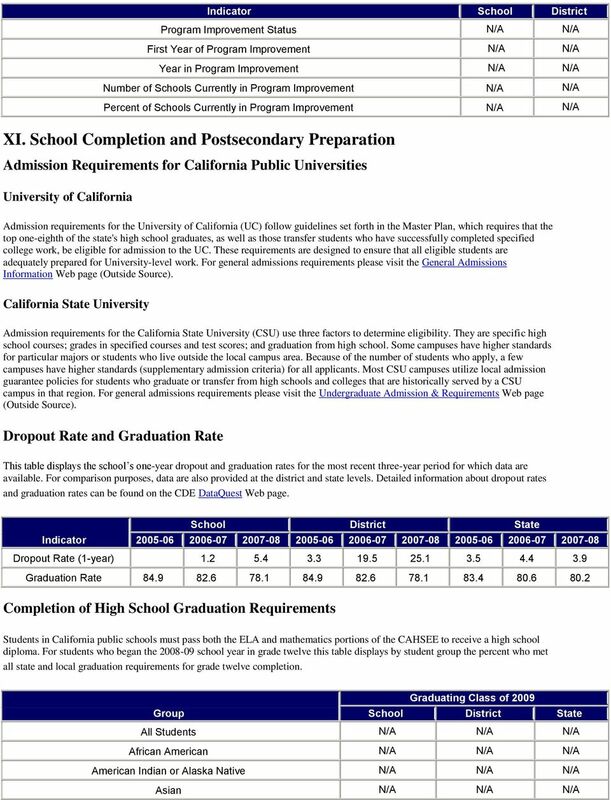 California High School Exit Examination Results The California High School Exit Examination (CAHSEE) is primarily used as a graduation requirement. 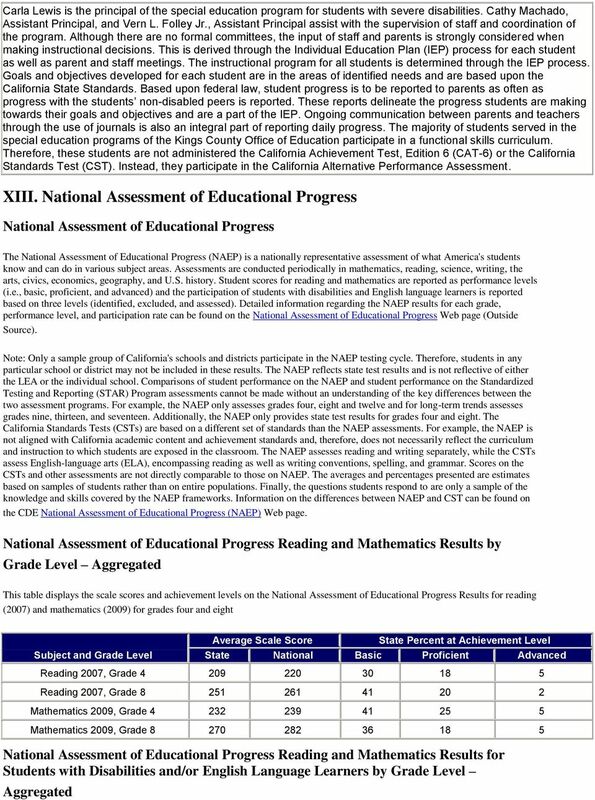 However, the grade ten results of this exam are also used to establish the percentages of students at three proficiency levels (not proficient, proficient, or advanced) in ELA and mathematics in order to compute Adequate Yearly Progress (AYP) designations as required by the federal NCLB Act of Detailed information regarding CAHSEE results can be found at the CDE California High School Exit Examination (CAHSEE) Web site. Note: Scores are not shown when the number of students tested is ten or less, either because the number of students in this category is too small for statistical accuracy, or to protect student privacy. In no case shall any group score be reported that would deliberately or inadvertently make public the score or performance of any individual student. 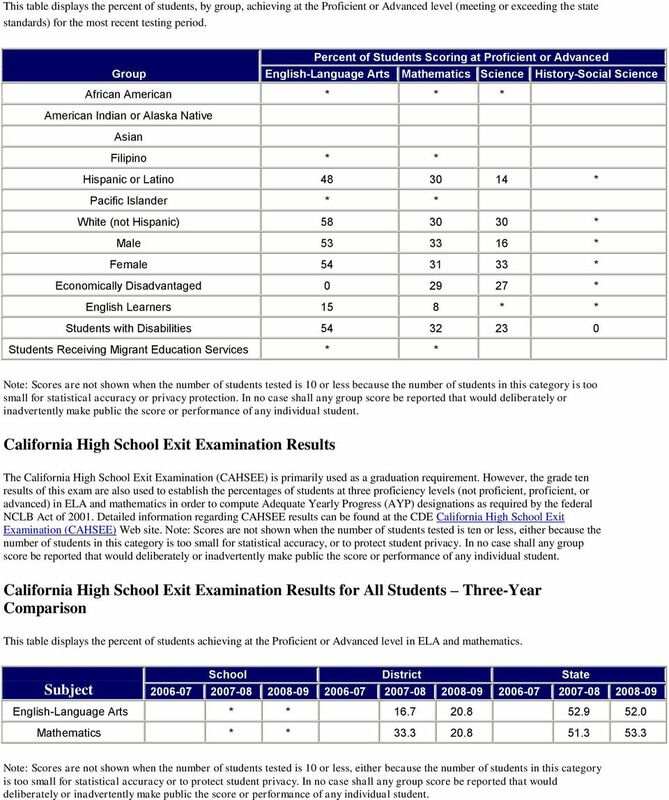 California High School Exit Examination Results for All Students Three-Year Comparison This table displays the percent of students achieving at the Proficient or Advanced level in ELA and mathematics. Subject School District State English-Language Arts * * Mathematics * * Note: Scores are not shown when the number of students tested is 10 or less, either because the number of students in this category is too small for statistical accuracy or to protect student privacy. In no case shall any group score be reported that would deliberately or inadvertently make public the score or performance of any individual student. 14 X. 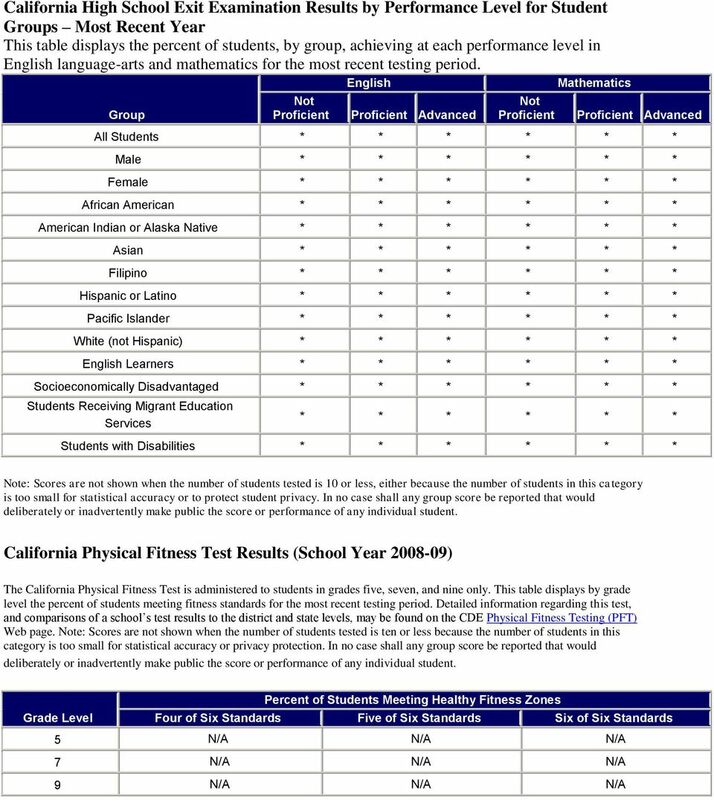 Accountability Academic Performance Index The Academic Performance Index (API) is an annual measure of the academic performance and progress of schools in California. API scores range from 200 to 1,000, with a statewide target of 800. 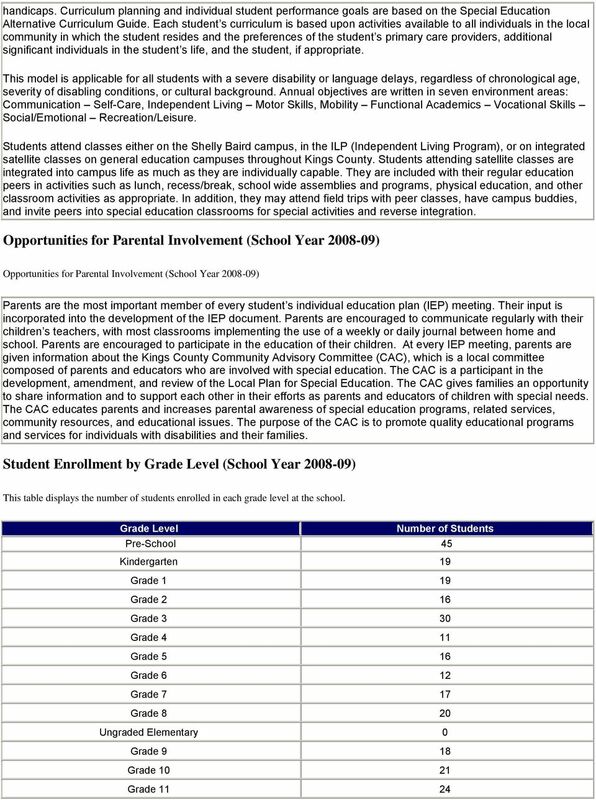 Detailed information about the API can be found on the CDE Academic Performance Index (API) Web page. 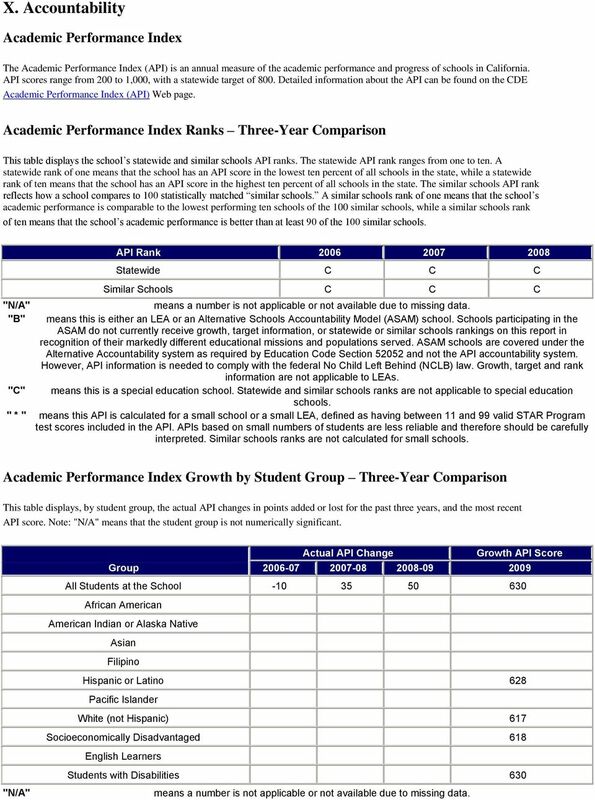 Academic Performance Index Ranks Three-Year Comparison This table displays the school s statewide and similar schools API ranks. The statewide API rank ranges from one to ten. A statewide rank of one means that the school has an API score in the lowest ten percent of all schools in the state, while a statewide rank of ten means that the school has an API score in the highest ten percent of all schools in the state. The similar schools API rank reflects how a school compares to 100 statistically matched similar schools. A similar schools rank of one means that the school s academic performance is comparable to the lowest performing ten schools of the 100 similar schools, while a similar schools rank of ten means that the school s academic performance is better than at least 90 of the 100 similar schools. API Rank Statewide C C C Similar Schools C C C "" means a number is not applicable or not available due to missing data. "B" means this is either an LEA or an Alternative Schools Accountability Model (ASAM) school. Schools participating in the ASAM do not currently receive growth, target information, or statewide or similar schools rankings on this report in recognition of their markedly different educational missions and populations served. ASAM schools are covered under the Alternative Accountability system as required by Education Code Section and not the API accountability system. However, API information is needed to comply with the federal No Child Left Behind (NCLB) law. Growth, target and rank information are not applicable to LEAs. "C" means this is a special education school. 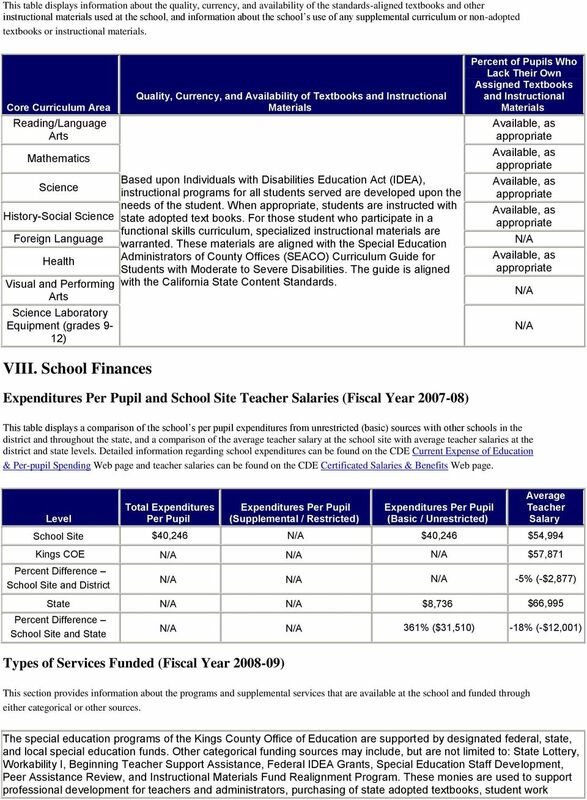 Statewide and similar schools ranks are not applicable to special education schools. " * " means this API is calculated for a small school or a small LEA, defined as having between 11 and 99 valid STAR Program test scores included in the API. APIs based on small numbers of students are less reliable and therefore should be carefully interpreted. 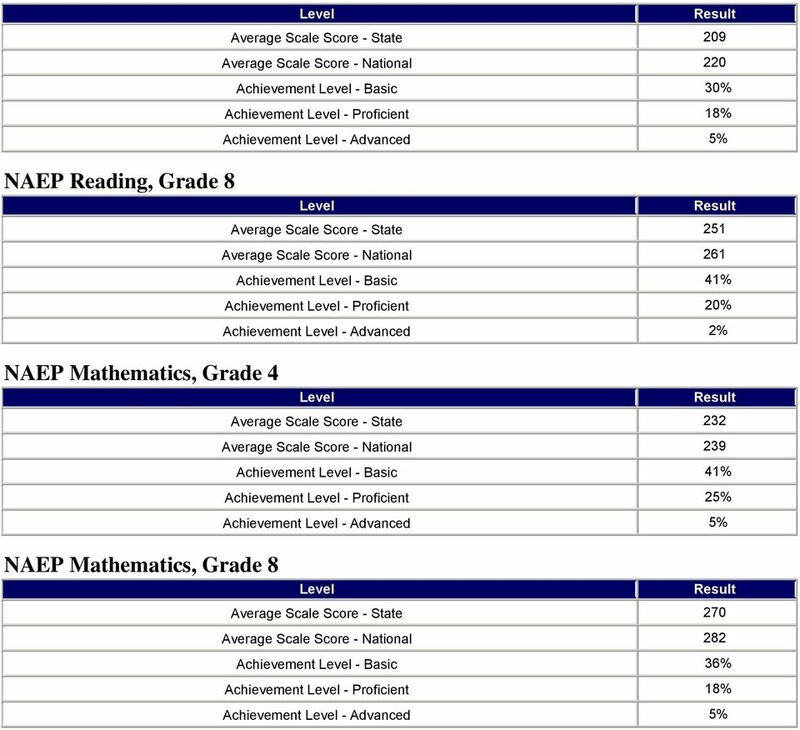 Similar schools ranks are not calculated for small schools. Academic Performance Index Growth by Student Group Three-Year Comparison This table displays, by student group, the actual API changes in points added or lost for the past three years, and the most recent API score. Note: "" means that the student group is not numerically significant. "" Actual API Change Growth API Score Group All Students at the School African American American Indian or Alaska Native Asian Filipino Hispanic or Latino 628 Pacific Islander White (not Hispanic) 617 Socioeconomically Disadvantaged 618 English Learners Students with Disabilities 630 means a number is not applicable or not available due to missing data. 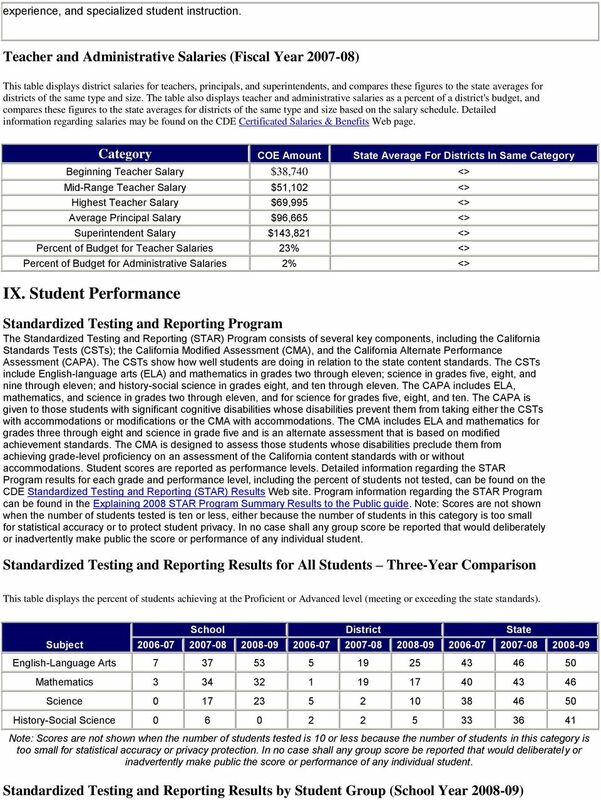 15 "*" means this API is calculated for a small school, defined as having between 11 and 99 valid Standardized Testing and Reporting (STAR) Program test scores included in the API. The API is asterisked if the school was small either in 2008 or APIs based on small numbers of students are less reliable and therefore should be carefully interpreted. Adequate Yearly Progress The federal NCLB Act requires that all schools and districts meet the following Adequate Yearly Progress (AYP) criteria: Participation rate on the state s standards-based assessments in ELA and mathematics Percent proficient on the state s standards-based assessments in ELA and mathematics API as an additional indicator Graduation rate (for secondary schools) Detailed information about AYP, including participation rates and percent proficient results by student group, can be found on the CDE Adequate Yearly Progress (AYP) Web page. 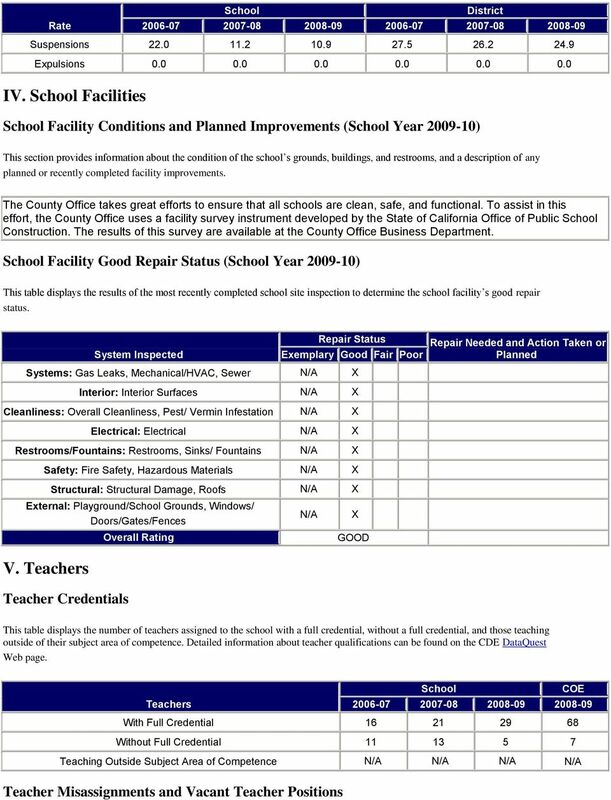 Adequate Yearly Progress Overall and by Criteria (School Year ) This table displays an indication of whether the school and the district made AYP overall and whether the school and the district met each of the AYP criteria. "Yes" "No" AYP Criteria School District Overall No No Participation Rate - English-Language Arts No No Participation Rate - Mathematics No No Percent Proficient - English-Language Arts Yes Yes Percent Proficient - Mathematics No No API Yes Yes Graduation Rate No No Met 2009 AYP Criteria Did not Meet 2009 AYP Criteria Federal Intervention Program (School Year ) Schools and districts receiving federal Title I funding enter Program Improvement (PI) if they do not make AYP for two consecutive years in the same content area (ELA or mathematics) or on the same indicator (API or graduation rate). After entering PI, schools and districts advance to the next level of intervention with each additional year that they do not make AYP. Detailed information about PI identification can be found on the CDE Adequate Yearly Progress (AYP) Web page. 17 Filipino Hispanic or Latino Pacific Islander White (not Hispanic) 2 2 Socioeconomically Disadvantaged English Learners Students with Disabilities Career Technical Education Programs (School Year ) This section provides information about the degree to which pupils are prepared to enter the workforce, including a list of career technical education (CTE) programs offered at the school. According to the federal Individual with Disabilities Act (IDEA), planning for the transition of a special education student from the school to the work environment begins when the student becomes sixteen (16) years of age. When appropriate, students participate in the Workability Program to give them work experience in real life settings. This program allows students the opportunities to use the vocational skills they have previously learned in the classroom in a work environment while earning a pay check. Adults accompany the students to provide job coaching. The goal is for the student to gain experience and the ability to work independently. Vocational opportunities are also available for students eighteen years of age and older who enrolled in the county s Independent Living Program. Career Technical Education Participation (School Year ) This table displays information about participation in the school s CTE programs. Measure CTE Program Participation Number of the school s pupils participating in CTE - Percent of the school's pupils completing a CTE program and earning a high school diploma - Percent of school's CTE courses sequenced or articulated between the school and institutions of postsecondary education Courses for University of California and/or California State University Admission (School Year ) - This table displays, for the most recent year, two measures related to the school s courses that are required for University of California (UC) and/or California State University (CSU) admission. 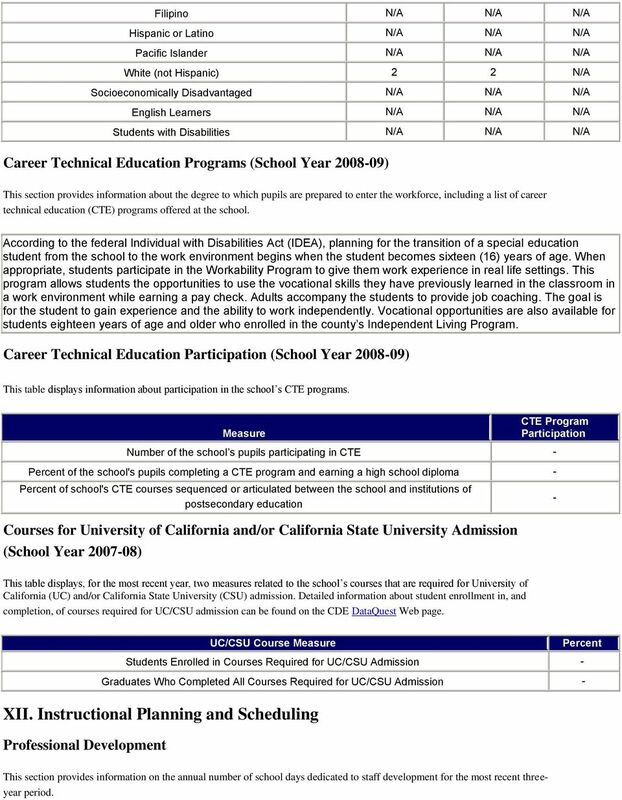 Detailed information about student enrollment in, and completion, of courses required for UC/CSU admission can be found on the CDE DataQuest Web page. UC/CSU Course Measure Percent Students Enrolled in Courses Required for UC/CSU Admission - Graduates Who Completed All Courses Required for UC/CSU Admission - XII. Instructional Planning and Scheduling Professional Development This section provides information on the annual number of school days dedicated to staff development for the most recent threeyear period.